Objective – The First Presbyterian Church FirstSchool was founded in 1978 as a ministry of the church to provide a unique learning experience for children of our church community. Our overall goal is to minister to the needs of each child in a nurturing Christian learning environment which promotes the growth of the total child. Philosophy – Firstschool is developmental in its approach. We believe that children learn best by doing, and that through play, children make discoveries on their own. What the child learns through creating something is more important than the finished product. We foster an atmosphere in which each child is valued by the teacher for his or her own individual qualities. Each one is encouraged to learn as benefits his or her level of readiness. 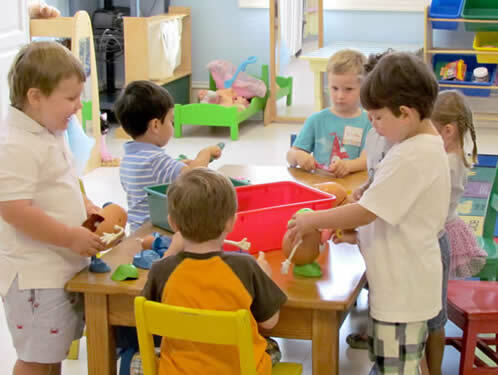 Program – The Firstschool program can be characterized as very positive, creative, relational, flexible and individualized. It includes a mixture of dramatic play, manipulative games, stories, singing, field trips, cooking experiences and many special activities which allow the child to interact with the world. Within this learning environment, three specific areas are stressed: self-concept, social skills, and language development. Firstschool hours are 9 a.m. to 12 p.m. for all classes. An optional Lunch Bunch program is offered until 1 p.m. on Monday, Tuesday, Thursday, Friday for 2, 3, and 4 year olds.